On June 17, 2018 Macedonia and Greece signed a historical agreement that settled 27 years of Name Dispute. Macedonian Prime Minister Zoran Zaev and his Greek counterpart Alexis Tsipras agreed on a new name for the Republic of Macedonia (internationaly recognized as the Former Yugoslav Republic of Macedonia): the Republic of North Macedonia. For almost three decades, the State of Macedonia and Greece were opposed on the use of the name “Macedonia” by the former. This conflict prevented Macedonia from joining NATO and the EU because of the Greek veto. The dispute’s longevity could surprise a layperson insomuch as the heart of the conflict seems to be a “simple” question of toponymy. It is actually linked to a deeper rivalry against a backdrop of competing heritage claims over Ancient Macedonia. Indeed, the term “Macedonia” refers simultaneously to the Republic of Macedonia and the Greek region of Macedonia, located in the North of the country. The territory of the ancient kingdom of Macedonia roughly corresponds to today’s Greek region plus the South of the Republic of Macedonia. Ancient Macedonia is the historic cradle of Philippe II and Alexander the Great. Starting from 500, Slavs settled in the territory of Macedonia. Two Macedonian identities are schematically distinguished: Slav Macedonians and Greek Macedonians. Macedonia, located in the heart of the Balkans has always been claimed by its neighbors. The historical region of Macedonia is known and its borders generally accepted. However, when the region was still part of the Ottoman Empire, it was claimed by Greece, Bulgaria and Serbia. In the beginning of the 20th century, the “Macedonian Question” was the symbol of the Balkan conflicts. These rival claims lead to the Second Balkan War, in 1913 that ended with the division of Macedonia between Greece (50% of the territory), Serbia (40%) and Bulgaria (10%). Le 40% belonging to Serbia became the Vardar Macedonia and formed after 1945 the Socialist Republic of Macedonia, a part of Yugoslavia until its independence in 1991. During the Greek civil war of 1948, Slav Macedonians were pushed off from the Greek Macedonia and now form an important diaspora in the Republic of Macedonia. The former VMRO-DPNE Prime Minister of the Republic, Nikola Gruevski, is a member of the diaspora, which may have impacted his policy regarding both the ancient heritage and the Hellenic State. The Greek and the Macedonian nations were both built on the use of the ancient Macedonian heritage to explain the ethnogenesis of its people. The rivalry between both narratives fueled the Name Dispute. The “antiquization” policy of the Republic of Macedonia was seen as a form of irredentism by the Greeks, thus preventing the former from being completed integrated to the international stage. The Agreement of the 17th of June 2018 is a milestone as it acts the official ending of the Name Dispute. However, after three decades of memorial policies that underlined the rival ancient heritage roots of both countries, the agreement of the population and of all the political parties should not be taken for granted. A vivid proof of this are the (sometimes violent) protests following the agreement. The Greek nation predates the Greek State. Starting from the Greek national independence in 1830 and until the end of the 19th century, the Hellenic State was embarked in a process of rebuilding the national identity through the rediscovery of its ancient origins to include the whole Greek territory in its historical narrative (and not just Ancient Greece). The Greek national history was built in a linear and diachronic way, the nation being the embodiment of this continuum between ancient Greece, the Byzantine period, the Ottoman occupation and the modern Greece. According to the French historian Paul Veyne, historiography is “intrinsically cultural”. Alexander the Great plays a major role in the cultural Hellenic identity. The symbol of Alexander the Great was used ideologically used in Greece as the indisputable proof of the Macedonian’s “Hellenicity”. National identity is constantly reinvented by the mobilization of national populations. Thus, several works show that Greek textbooks have a “historio-mythical narrative” of the ancient Macedonian past. This interpretation has been especially significant since the discovery in 1977 of a tomb attributed to Philip II, father of Alexander the Great, in the burial site of the kings of Macedonia in Vergina. The archeologist Maonils Andronikos discovered in the tomb a sixteen-point star called the Vergina Sun or Star of Vergina. From then on, Vergina Suns flourished in public and private places, especially. This discovery was followed in the 1990s by the generalized the expression “Greek Macedonia”. The uniqueness of Alexander the Great’s conquest was used as an argument in political speeches since the 1990s in order to justify the singularity and unicity of the Greek national identity and to “delineate the real of senses attached to the name ‘Macedonia’”. Through this national building around the Macedonian ancient heritage, the majority of the Greek public opinion, regardless of its political stripe, considers that “no one else than Greeks have the right to use the name Macedonia or Macedonian, whether it is as an ethno-cultural or geographical denomination”. The Greek State thus assimilates the ancient Macedonian heritage to Greek history. According to Georges Prévélakis, geo-politician and specialist of the Greco-Macedonian relations, the Macedonian State “needed to find a national identity referent that allowed for the construction of a national mythology”that may be more or less artificial but that makes it possible to overcome the contradiction between the two main identities of the territory (that is Albanians and Slavs). This narrative is a case of an “invention of tradition”, to adopt Eric Hobsbawm’s words, that is “process of formalization and ritualization, characterized by reference to the past, if only by imposing repetition”. In the Macedonian case, this invention of tradition has been theorized as “antiquization”. Anastas Vangeli defines it as “the identitarian policies based on the assumption that there is a direct link between today’s ethnic Macedonians and Ancient Macedonians”. Before the independency of the Republic of Macedonia, little reference is made to the Antiquity. Until the fall of communism, the favored ethnogenesis is the Slav one and does not postulate the existence of a historical continuity between contemporary Slav Macedonians and the ancient Macedonian people, distinct from the Hellenic civilization. If we follow E. Hobsbawm’s theory, the omnipresence of the national theme in the political and intellectual elites’ speeches would be a form of compensation for the economic, political and social laggings of the country. 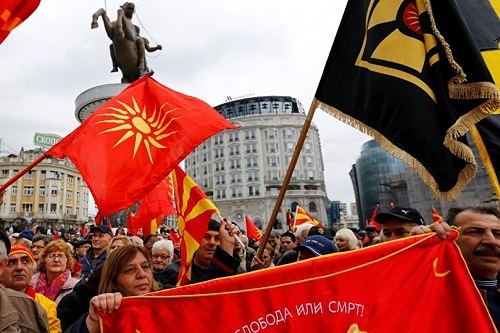 Consequently, the national identity is the main distinguishing criterion among Macedonian political parties: the VMRO-DPNE is openly nationalist; the SDSM presents itself as more open to intercommunity dialogue. From 1991, the references to the Ancient Macedonian get more and more frequent. Between 1992 and 1995 the Republic of Macedonia even uses the Vergina Sun as its official flag. In 2006, the VMRO-DPNE comes to power: antinquization becomes an institutionalized policy. In 2008, after the failure of the Macedonian candidacy to NATO, the VMRO-DPNE-led government increases the antiquization: it presents in 2010 a large-scale construction project called “Skopje 2014” (in practice started in 2006) that includes the building of monuments, statues and fountains that glorify the antique roots of the present Macedonia. The centerpiece is the “Warrior on a Horse” monument, a 25-meter high bronze statue of Alexander the Great in the center of Skopje, officially inaugurated 8 September 2011 in the context of the 20thindependence anniversary. The government also decided of the name change of Skopje’s airport and of the principal highway, both being renamed “Alexander the Great”. This policy is the epitome of the “mass-producing” of traditions. With the use of Alexander the Great as the founding myth of the national Macedonian identity, the Macedonians distinguish themselves from the other Slavs and, at the same time, try to benefit, like the Greek, from the Antique prestige. The value of such memorial policies does not lie in the historical truth but in its ability to carry an idea to which the population can adhere. The antique heritage, poison of the Greek-(North)Macedonian relations on the international stage? The claim on the antique heritage is a disagreement’s factor. Since the Republic of Macedonia’s independency, Greece contested the use of the word “Macedonia” in the name of the country. In 1993, Macedonia became a UN member under the name “Former Republic of Macedonia” (FYROM) in order to avoid a Greek blockage. The use of the Vergina Sun as the national Macedonian flag in 1992 was contested as well by the Greek government. In February 1994, the Greek Prime minister, Andras Papandréou decrees a trade embargo against the Republic of Macedonia, who loses the access to the harbor of Thessaloniki. The Macedonian State, already economically weak before the embargo, is forced to negotiate. An interim agreement is found in New York in 1995: in exchange of the lifting of the embargo, the Republic of Macedonia changed its flag, revised its Constitution to include the inviolability of borders and the sovereign rights of Greece on the minority question, to prevent Macedonia from restoring the “Greater Macedonia”. The Greek State recognized the Macedonian State under the name FYROM and agreed “not to object to the application by or the membership of the (FYROM) in international, multilateral and regional organizations and institutions of which (Greece) is a member” under the condition that Republic of Macedonia uses the name FYROM. The Greco-Macedonian relation was then normalized. The Greek State even supported the FYROM’s candidacy to the EU in 2005. However, Greece regarder the increased Macedonian antiquization policy of the VMRO-DPNE from 2006 as a provocation and an obstacle to FYROM’s EU and NATO membership. This was reinforced by the coming to power of Conservatives in Greece in 2006. At the 2008 NATO Summit in Bucarest, the Hellenic State vetoed FYROM’s candidacy to NATO. In response, the Republic of Macedonia brought the matter in front of the International Court of Justice (ICJ). In 2011, the CIJ ruled the Greek State had indeed violated Article 11 of the 1995 Interim Agreement. These events show the weight of the use of the ancient heritage in the Greco-Macedonian relations. After the 2008 blockage, the response of the Macedonian Prime Minister Nikola Gruevski was to further the antiquization to alleviate the negative feelings caused by the non-NATO membership. Is the name dispute resolved? Since May 31, 2017, the Macedonian government is headed by the pro-EU and pro-NATO Zoran Zaev, member of the SDMS. Negotiations restarted. When it was an opposition party, the SDSM was very critical of the national policy carried out by Nikola Gruesvki and the VMRO-DPNE, both from a financial and ideological standpoint. This thaw can also be explained by the fact that NATO considers Macedonia’s stability as a key to the regional stability and thus wants to integrate it the soonest possible. The agreement signed on June 17, 2018 by both countries’ Prime Ministers was welcomed by the international community. However, nationalists in Greece and in Macedonia vehemently oppose the name change. The new name will have to be confirmed by a Macedonian referendum in the upcoming year. According to RFE/RL, “5 percent of Macedonians would sacrifice NATO and EU membership to keep the Macedonia name, while nine out of 10 ethnic Albanians – who make up more than one-quarter of the country’s 2.1 million population -would not.” Consequently, the risk does not (mostly) reside in a possible refusal of the name change but on rising tensions between communities in the country. Another hurdle to the obstacle could be the Macedonian President, Gjorge Ivanov who made no secret of the disagreement with the new name. If voted by the Parliament, the agreement can be vetoed by the president once. If the Parliament votes it a second time, the veto is circumvented. The agreement was signed in attendance of Federica Mogherini, Representative of the European Union for Foreign Affairs and Security Policy. The EU accession process of Macedonia should be restarted in the following weeks. However, the accession process might take time. In February 2018, the European Commission presented its “Strategy for the Western Balkans” in which the president of the Commission Jean-Claude Juncker reaffirmed that the EU will be “rigorous” regarding the reforms needed. The message was: “keep reforming and we will keep supporting your European future”. In other words, the future of the regional integration of Macedonia lies on the outcome of its referendum, how efficient the “antiquization” policy was to convince the citizens of Macedonia that being called “Macedonian” was more important than being part of the EU and NATO. 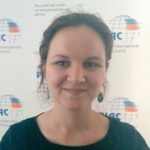 Emmanuelle Rousseau, after obtaining her BA in Law in 2016, is finishing her Master’s degree in International governance at Sciences Po Toulouse, while pursuing a BA in Russian studies at the University Toulouse – Jean Jaurès. Her primary areas of focus are International Organizations, Eastern Europe and the Post-Soviet space. Emmanuelle interned at RIAC in the summer of 2017.